Sometimes you have to satisfy a hankering. 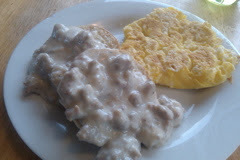 This week it was biscuits and gravy. I make this dish very rarely because it's so rich, and, truth be told, I love it so much that I used to eat it even when I was a vegetarian. Today, however, was a special morning. My aunt joined us for breakfast for one last visit before she moved out of the state. 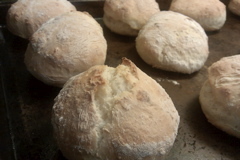 After I had had my second cup of coffee, I made some simple baking powder biscuits*. While the biscuits were baking, I started to brown the sausage. I picked up 1/4 lb. of breakfast sausage at the butcher's counter, but I'm sure Jimmy Dean would be Ok (don't tell my butcher). 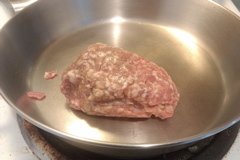 Over medium high heat, cook the meat until lightly browned. 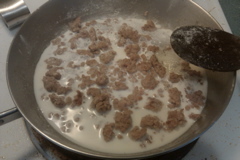 When the fat has rendered out of the meat, sprinkle 2 to 3 tablespoons of flour over the skillet. 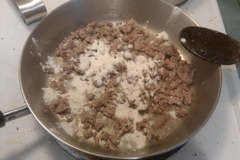 Stir to coat the meat with the flour. 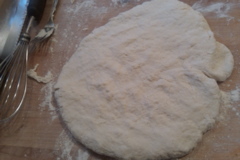 It'll thicken up and be yummy, yummy, yummy. Don't forget to add enough salt and freshly ground pepper which are two of the corner stones for this incredible breakfast!! This is NO Place to skimp on salt. The Cream Biscuit recipe called for 2 cups of flour to 1 1/2 cups of milk... the makings for a soupy, batter-like mixture that needed some serious mending. By the way, I failed. I won't tell you what I did because I wouldn't recommend it to my worst enemy. It sure looked good for the photos though, huh? Huh? 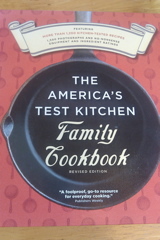 The recipe that I meant to use and is always successful is Betty Crocker's Baking Powder Biscuits. They are fluffy and flavorful. Definitely recommended. 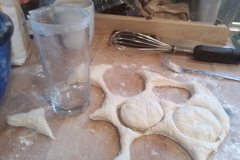 Toast the hockey puck-like biscuits and butter them for snacks later in the afternoon. With whatever leftovers you've got, grate them or pulverize them in a food processor for later bread crumb use.